One aspect of doing railroad photography I enjoy is taking a photo of a particular location and then trying to photograph that same location years later. 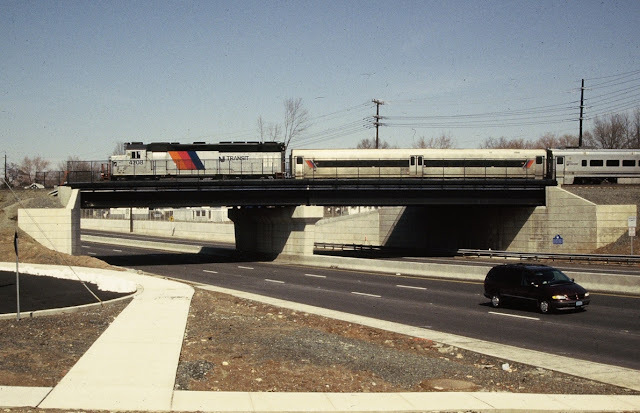 When NJT's RVL Bridge was rebuilt back in 2004 I photographed NJT 4208 leading its consist across this bridge on March 20, 2004. Back then there were no trees planted or grass growing as this was all recently landscaped. Fourteen years later I am back close to where that first photo was taken. 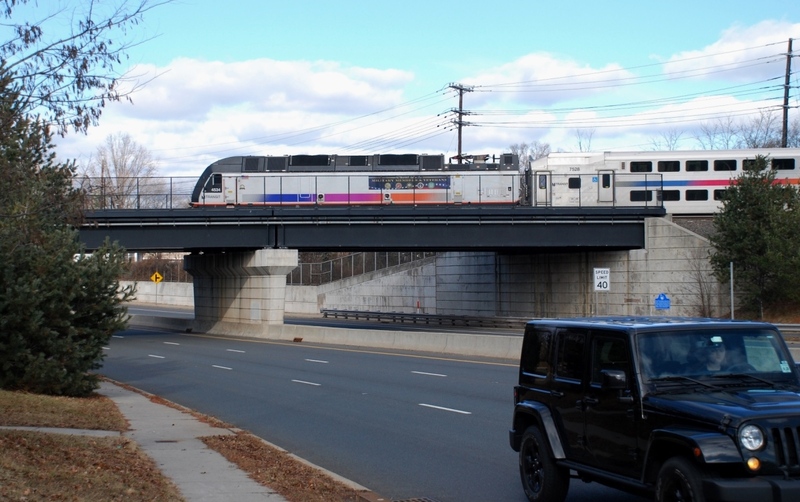 Mature trees have partially obscured some of the bridge as NJT train 5123 is led across the bridge by NJT 4534. That is the "NJ Transit salutes our Military Members and Veterans" unit leading its consist of bilevels! NORFOLK, Va., Jan. 24, 2018 – Norfolk Southern Corporation (NYSE: NSC) today reported fourth-quarter and 2017 financial results. Net income for the quarter was $3,968 million and diluted earnings per share were $13.79. For the year, net income was $5,404 million and diluted earnings per share were $18.61. These results include effects of the enactment of the Tax Cuts and Jobs Act of 2017 (“tax reform”), which added $3,482 million to net income in both periods and increased diluted earnings per share by $12.10 for the quarter and $12.00 for the year. Absent the effects of tax reform, fourth-quarter 2017 adjusted net income was $486 million, and adjusted diluted earnings per share of $1.69, compared with $416 million, and $1.42 per diluted share, during the same period of 2016. For the year, adjusted net income was $1,922 million versus $1,668 million in 2016. Adjusted diluted earnings per share were $6.61, an 18 percent increase over last year’s record diluted earnings per share of $5.62. For 2017, Norfolk Southern invested over $1.7 billion in capital - reinvesting in the maintenance of its rail infrastructure and supporting economic growth. 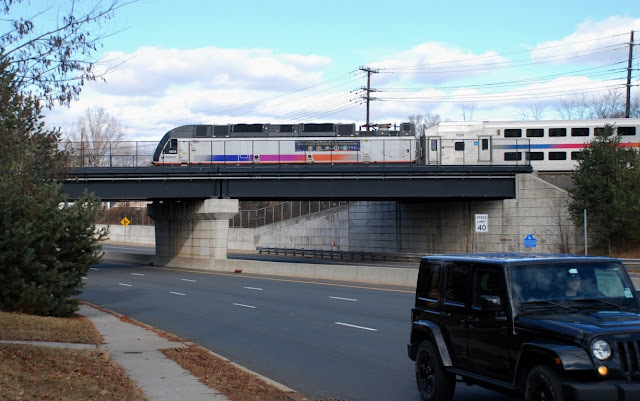 These investments range from sidings that better support network fluidity, to terminal expansions that accommodate volume growth, to roadway infrastructure that supports regional competitiveness. The recently-completed Portageville Bridge is one example; funded through a public-private partnership, it will support economic growth and jobs across New York’s Southern Tier region. Norfolk Southern also realized new business in 2017 from 75 industries it assisted in locating or expanding along its lines – representing a customer investment of over one billion dollars. 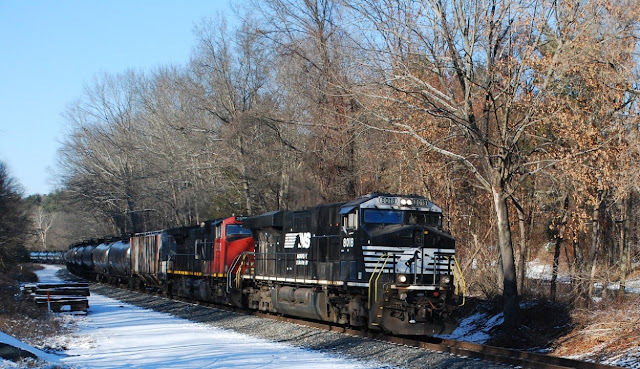 Looking forward in 2018 with respect to capital deployment, Norfolk Southern plans to invest $1.8 billion to maintain the safety of its rail network, enhance service, improve operational efficiency, and support growth. In addition, Norfolk Southern’s board of directors approved an 18 percent increase in its quarterly dividend on the company’s common stock, from $0.61 to $0.72 per share. The dividend is payable March 10, to shareholders of record on Feb. 2. Since its inception in 1982, Norfolk Southern has paid dividends on its common stock for 142 consecutive quarters. · Railway operating revenues of $2.7 billion increased 7 percent compared with fourth-quarter 2016, as overall volumes were up 5 percent reflecting growth in all three major commodity categories of intermodal, coal and merchandise. Railway operating expenses decreased $74 million, or 4 percent, to $1.7 billion compared with the same period last year. The effects of tax reform decreased railway operating expenses $151 million, more than offsetting increases resulting from increased incentive compensation, higher fuel prices and the 5% growth in volume, which were offset in part by efficiency gains and higher property sales. Income from railway operations was $1,014 million. Excluding the $151 million benefit from tax reform, adjusted income from railway operations was $863 million, an increase of 13 percent year-over-year, and the adjusted railway operating ratio, or operating expenses as a percentage of revenues, was 67.7 percent, a 170 basis point improvement over prior year. · Railway operating revenues of $10.6 billion increased 7 percent compared with 2016, as overall volumes were up 5 percent reflecting growth in the major commodity categories of coal and intermodal. Railway operating expenses of $7.0 billion increased $151 million, or 2 percent, compared with last year. Expenses related to higher diesel fuel prices, increased incentive compensation, higher inflationary costs and volume growth were offset in part by efficiency savings and the $151 million benefit from tax reform. Income from railway operations was $3,586 million. Excluding the tax reform benefit, adjusted income from railway operations was $3,435 million, an increase of 12 percent over the prior year, and the adjusted railway operating ratio was 67.4 percent, a 150 basis point improvement over the prior year’s record. This news release contains forward-looking statements that may be identified by the use of words like “believe,” “expect,” “anticipate,” “estimate,” “plan,” “consider,” “project,” and similar references to the future. Forward-looking statements reflect our good-faith evaluation of information currently available. These forward-looking statements are subject to a number of risks and uncertainties, and our actual results may differ materially from those projected. Please refer to our annual and quarterly reports filed with the SEC for a full discussion of those risks and uncertainties we view as most important. Forward-looking statements are not, and should not be relied upon as, a guarantee of future performance or results, nor will they necessarily prove to be accurate indications of the times at or by which any such performance or results will be achieved. As a result, actual outcomes and results may differ materially from those expressed in forward-looking statements. We undertake no obligation to update or revise forward-looking statements. Information included within this press release includes non-GAAP financial measures, as defined by SEC Regulation G. Non-GAAP financial measures should be considered in addition to, not as a substitute for, the financial measures reported in accordance with U.S. generally accepted accounting principles (GAAP). GAAP financial results are adjusted to exclude the effects of the Tax Cuts and Jobs Act ("tax reform"), signed into law on Dec. 22, 2017. Specifically, the adjustments remove the effects of remeasurements of net deferred tax liabilities related to the reduction of the federal tax rate from 35% to 21%. The Company uses these non-GAAP financial measures internally and believes this information provides useful supplemental information to investors to facilitate making period-to-period comparisons by excluding the effects of tax reform. While the Company believes that these non-GAAP financial measures are useful in evaluating the Company’s business, this information should be considered as supplemental in nature and is not meant to be considered in isolation or as a substitute for the related financial information prepared in accordance with GAAP. In addition, these non-GAAP financial measures may not be the same as similar measures presented by other companies. NORFOLK, Va., Jan. 23, 2018 – Norfolk Southern Corporation announced that its board of directors today approved an 18 percent increase in its quarterly dividend on the company’s common stock, from 61 to 72 cents per share. “This dividend increase demonstrates the board’s confidence in Norfolk Southern’s ability to invest in our business and in technology to grow and provide service to our customers, while returning capital to our shareholders consistent with our Strategic Plan,” said James A. Squires, Norfolk Southern chairman, president, and CEO. The dividend is payable March 10, to shareholders of record on Feb 2. Since its inception in 1982, Norfolk Southern has paid dividends on its common stock for 142 consecutive quarters. Checking one of the websites that lists if an NS heritage unit is leading a train I saw the Virginian heritage unit was leading intermodal 20K. With Thursday having good sunlight 20K and sunshine would be the motivation that got me track side to wait for it. My initial location would be Stanton Station were afternoon lighting is usually good. At 1:57 PM I received a text stating an eastbound train just passed through Phillipsburg (NJ). Hmmm... perhaps it would not be much longer now I thought to myself. Unfortunately that train would be NS 64E, a unit tank train of ethanol. Motive power would find NS 8018 leading with CN 2523 trailing. With shadows starting to fade into the scene I decided to head down to Hillsborough where the Lehigh Line crosses Route 206. Here the 64E sort of snuck up on me as I was able to grab one shot as it crossed over the highway. As for that 20K, after leaving my last location I decided to head over to the Valley Road grade crossing which is basically a ten minute drive from where I was. Doing this would allow me to check that block signal and see if the 20K might have a green signal. Rounding the curve and seeing the grade crossing's down gates 20K had been only fifteen minutes behind that 64E and already passing through this grade crossing -Aaaargh! I guess the "five minute rule" was engaged on this day for me. BDRV purchased 6 boxcars around 1997-1998 for outbound loads from the paper mill in Milford,New Jersey. BDRV 101-105,111. Only #111 remains as #101-105 were scrapped around 2004. 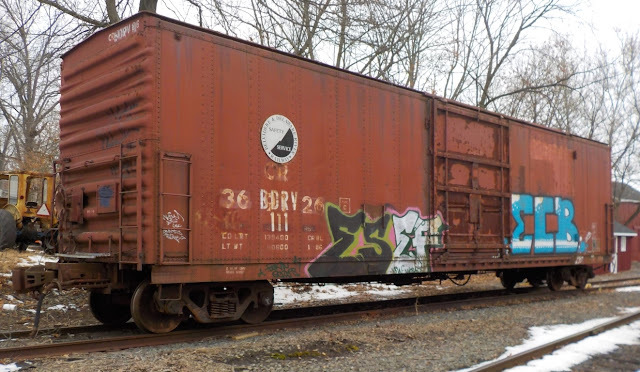 BDRV is seen on the BR&W's Three Bridges siding on January 11, 2018. NORFOLK, Va., Jan. 11, 2018 – Norfolk Southern assisted 75 industries in locating or expanding their business operations along its rail lines in 2017. The 54 new and 21 expanded industries across 17 states represent an investment of $1.1 billion by Norfolk Southern customers. This economic development is expected to create nearly 2,000 new customer jobs in the railroad's service area and generate over 147,000 carloads of new rail traffic annually. 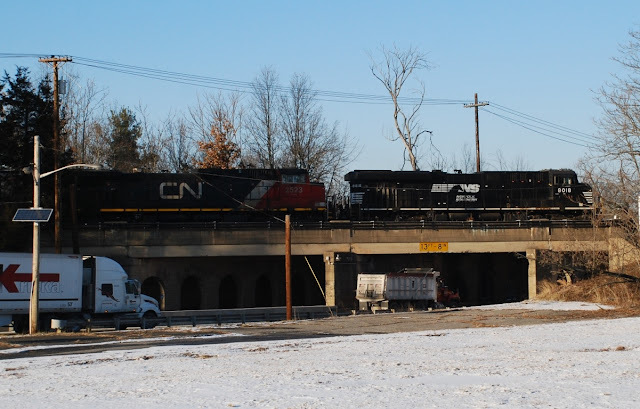 Norfolk Southern works with state and local economic development authorities on projects involving site location and development of infrastructure to connect customers to its rail system. Norfolk Southern provides free and confidential facility location services, including industrial park planning, site layout, track design, and supply-chain analysis. During the past 10 years, NS’ Industrial Development Department has participated in the location or expansion of 922 facilities representing private investment of over $60 billion and creating nearly 41,000 direct new customer jobs in territory the railroad serves.